As we age, the spirit is willing, but the flesh is weaker...when it comes to gardening. Our enjoyment of growing fruit, flowers and vegetables seems to increase as the years fly by. Maybe it's because we've come to better appreciate how nature works; maybe it's because we enjoy doing things closer to home; or, maybe it's because plants don't talk back. Here are some tips for implementing an easy-care garden for the Golden Years, advice that can be summed up in three words: automate, elevate and eliminate. • Automate. Provide your garden with an automatic watering system. The efficiency of an automated sprinkler or drip irrigation system protects your plants from the summertime heat when you're away from home. 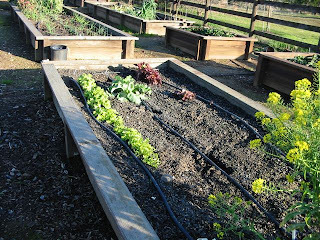 And, a good drip system reduces water usage, unwanted weed growth and plant diseases. Install low-voltage night lighting, equipped with sensors, to automatically come on at sunset throughout the yard. • Eliminate. Why waste time fretting over a habitually under performing perennial, shrub or tree? 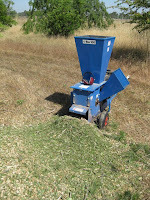 If it is growing awkwardly or is consistently pest infested despite your best efforts, bring out the chipper/shredder. Dig it out, chop it up and get another plant that will do better. Better yet, have someone else do the digging and chopping. One sign of advancing age--eagerly clicking on article titles like this! Thanks for the sound advice.